These modular lines can be linked together, to provide you with any combination of attachment points, or separated if space is a premium. Constructed from 4-6mm Clear PVC coated steel, so you can monitor the line underneath for any damage and strong solid Brass trigger clips. Each 40cm* drop features a swivel, drops are spaced 150cm* apart. If you require different length drops or spacing please contact us and we will be more than happy to discuss. 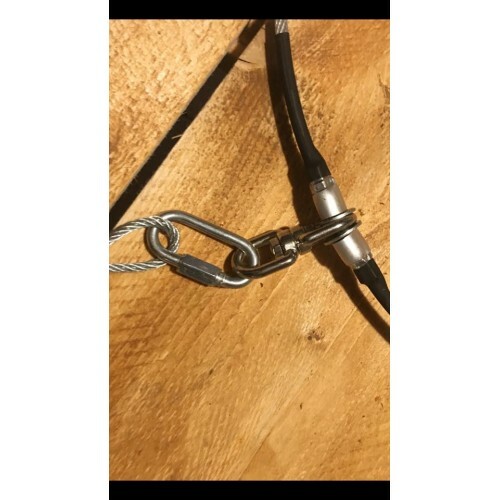 3 way rotation, the drop rotates 360 degrees around the main line, connected to the line is a heavy duty swivel link, followed by a brass trigger clip with swivel joint. 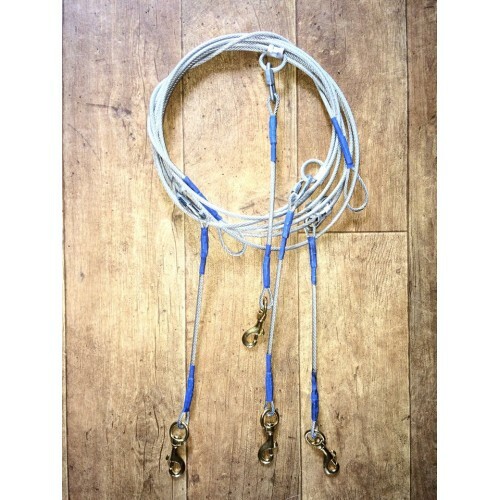 This line was designed and developed by Hooner after an accident with another brand of stake out line. One of our younger dogs wrapped the thinner wired line round her leg and when the rest of the dogs pulled it cut off circulation to her leg causing her to panic further, luckily we were able to cut off her collar to free her. 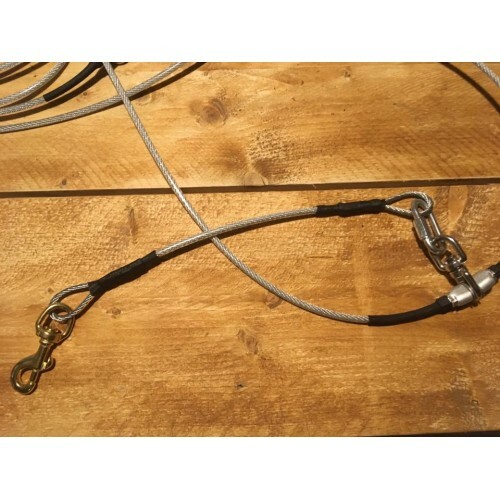 With this design the wire is much thicker than other brands, rendering it near impossible for a dog to get the line tightly wrapped around a limb. They also have a small pack size, making transport very easy.